I'm working on some code to build arches of various types. I have some code working that builds arches using two circles (trivial). I am now working on a general "four cirlce" arch (sometimes called "loin of the donkey", or "ogee" arch). My solution looks like it works when the radii are equal but the angles of intersection (among other things) are clearly off. If the radii are not equal this becomes quickly evident (even if they are equal and you zoom in a lot you can see there is some incorrect overlap). Anyone good with geometry who can point out my problem? I also copied two routines from this list to aid me "pie_slice()" and "point()"
That code is infinitely more elegant than what I wrote. I might need more help later on since I'm not sure how to make it do some of the things I am thinking about, but I'll play around with it for now and ask if I need more help. where a = acos((r2 - O/2 - t - r1)/( r1 + r2 )). This will give you the outer border of the arc. 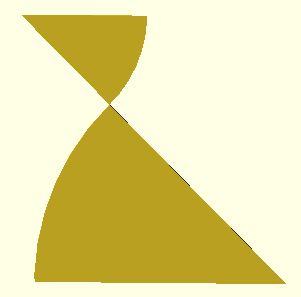 For the inner border, the angle a is the same. When you say C1 and C2 do you just mean C1 and C2 or something else? angle a is the same. I'm going to play around with both solutions because runsun's is extremely elegant but might be a huge challange to my brain to get it to do a generalized ogee. runsun: I'm trying to move what you did so the bottom is lying on the x axis and the top is on the y axis. I can get the bottom on the x axis via a translate with y value: (r2*(cos(45))) but when I try to do something similar to get the top in line I can't get it right. C1 is a 2D point; it has two components or coordinates; C1 is the first; C1 is the second. similar to get the top in line I can't get it right. > similar to get the top in line I can't get it right. Note that $fn is a global variable. See the OpenSCAD manual.